Our latest discovery concerns synced Safari history. While researching this sync, we discovered that deleting a browsing history record makes that record disappear from synced devices; however, the record still remains available (but invisible) in iCloud. We kept researching, and discovered that such deleted records can be kept in iCloud for more than a year. 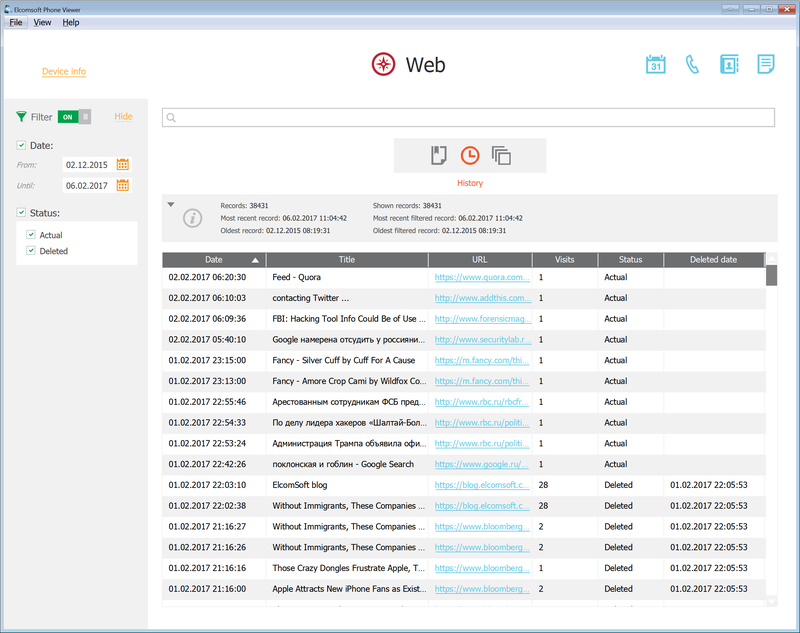 We updated Elcomsoft Phone Breaker to give it the ability to extract such deleted records from the cloud. Moreover, we were able to pull additional information about Safari history entries including the exact date and time each record was last visited and deleted! Forensic use of synced data is hard to underestimate. Unlike cloud backups that are created daily at best, iCloud sync works nearly in real-time. Being able to track suspect’s activities almost no delay can be invaluable for surveillance and investigations. Since deleting browsing history from iCloud is nearly impossible for the user, discovering illicit activities becomes much easier. Experts will be able to recover visits to extremist and other illicit Web sites even if the suspect deletes their browser history or wipes their iPhone. Apple has multiple privacy policies in place. In particular, the company promises not to keep information the user deletes from iCloud for more than 30 days. In the past, we found Apple to be somewhat lax about its privacy policies. At one time, we discovered that Apple were keeping deleted iCloud photos for much longer than the time period specified in their policy. On another occasion, we discovered that Apple syncs call information with their cloud servers, giving users no indication and no concise way to disable that sync. While many users disable iCloud backups for privacy reasons, those same users are commonly unaware of privacy implications that arise of those cloud syncs. Cloud synchronizations are rarely disabled as there is simply no clear way to do this. Moreover, disabling cloud sync would require disabling iCloud services, which has severe impact on device usability. If Safari history is stored in the cloud, how can one get access to the records? One idea that doesn’t work would be setting up a new iPhone or iPad with the user’s Apple ID. While Safari browsing history will appear on the new device, the system will only bring the last 30 days of history – and no deleted records. Finally, the user is alerted via an email notification that someone just had access to their cloud account (Elcomsoft Phone Breaker does not trigger this notification unless the user has Two-Factor Notification enabled, in which case a 2FA alert inevitably pops up). Safari history is synced across devices. Once you delete a record on one device, it will disappear on all other devices in a matter of seconds (or minutes), provided that those devices are connected to the Internet. While those records can be retained in SQLite database for technical reasons, a flush or cleanup will purge them sooner or later (on an actively used device, this can happen in a few days or up to 2-3 weeks). However, those same records will be kept in Apple iCloud for much longer. In fact, we were able to access records dated more than one year back. The user does not see those records and does not know they still exist on Apple servers. Elcomsoft Phone Breaker 6.40 can be used to extract those deleted browsing history records, while Elcomsoft Phone Viewer 2.25 is updated to allow filtering existing and deleted records. 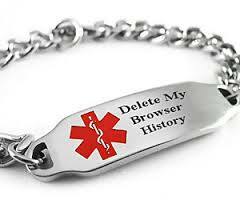 Optionally, apply filter to specify records for actual or deleted browsing history records. Note: You’ll be also able to see the date and time on which the records were deleted. In order to extract Safari history from iCloud, you’ll need to authenticate into the user’s Apple ID. While you can use the login and password combination, sometimes you simply won’t know the password. If this is the case, you can use an authentication token extracted from the user’s computer. Elcomsoft Phone Breaker comes with tools to help experts extract iCloud authentication tokens. These tokens are automatically created by iCloud Control Panel on Windows and Mac computers that were synced with iCloud. By using the token to log in, you’ll bypass both the password and the secondary authentication prompt if two-factor authentication is enabled on the user’s account. As a result, iCloud access alert will not be delivered to the user. This entry was posted on Thursday, February 9th, 2017 at 11:58 am	and is filed under Did you know that...?, Elcom-News, Software. You can follow any responses to this entry through the RSS 2.0 feed. Both comments and pings are currently closed. Can you tutorial with icloud without passwork, but can access data or into login. Sorry, not sure that I understand the question. 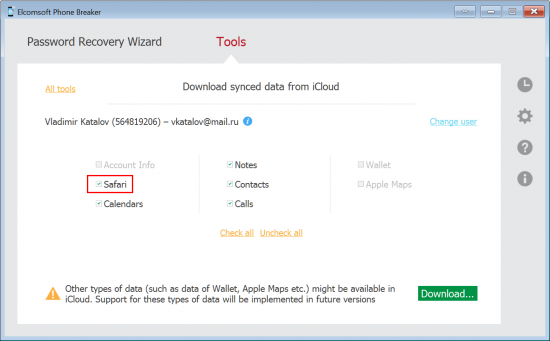 Do you need to access the iCloud data without password? It is possible with authentication token (that can be extracted from PC, Mac or iOS device that is set to log on into the given account). Using non-ElcomSoft forensic softwares to access iCloud, I experienced that this account activity often leads to a blocked/disabled Apple Id. Is it maybe due to the type of acces that program use? Or it’s due to the use of iTunes (with all its preference files installed on PC)? What’s the major fatures in how ElcomSoft connect to icloud servers? Does ElcomSoft software cause this kind of blocks too? I had that problem too, now it’s saying the login credentials are incorrect when I’m trying to download my pictures. Then I went to download the entire backup and it’s saying there’s no backups to be downloaded. I’m thinking they’re working on blocking Elcomsoft? I used to work for a company where the person responsible for our IT problems stole my password and knew my email address. This password and my email address are the same one that I used for my Icloud. How can this person access al my information and for example read my email? Can he read all my emails just by login to my Icloud and read all my emails from my Hotmail account or does he needs to login to my Hotmail account to read them? Can he access al my information from the Icloud just by having my email address and the password or does he needs to own other software, tools, etc. to do so? How can I prove to the police that somebody has been accessing my account? Where can I find this information (Icould activity logbook)? In addition can somebody leave spyware or other software in my Icloud so they can spy on me or leave the camera on and even when I change my password they have some kind of access to my Icloud? Does this feature still work? Thank you.